VOILES > WHAT ARE VOILE CURTAINS? So you want privacy without having to sacrifice natural light? Then a set of semi-transparent voile curtains might well be what you need. This curtain variety, whose name is derived from the French word for ‘veil’, is made from a thin sheet of lightweight fabric that allows light to diffuse through your interior while still providing privacy. Voiles are available in a range of different styles and colours, as well as synthetic and natural materials. What’s more, they’re affordable and can be used alongside heavier curtains for a compromise between heat efficiency, privacy and light dispersal. They also prevent allergens from entering the home through an open window. Good news for hayfever sufferers. Madison Embroidered Slot Top Panels. Get them here. There are several different types of voile curtains to choose from. The ‘slot top curtain’ incorporates a single long pocket which runs across the top of each panel. 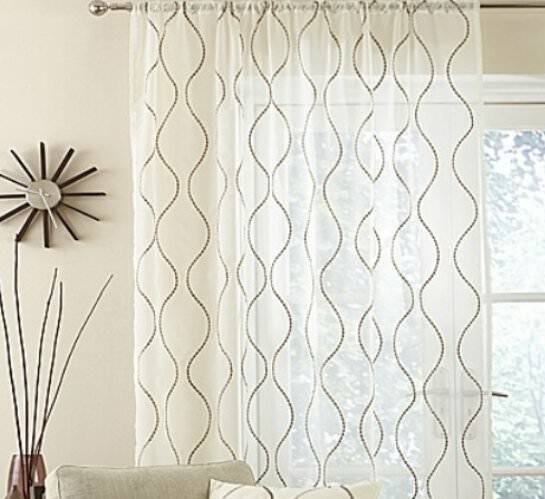 This can be threaded onto a curtain rod, allowing the panel itself to hang freely underneath. Tab top panels are very similar to slot top panels, except that instead of a single slot running across the width of the panel, there are several tabs spaced at regular intervals. This exposes the curtain rail beneath, giving a similar impression to traditional curtains suspended from a rail using hoops. Tied blinds do not cover the entire length of the window, but stop midway, and so are used as a decorative dressing. They derive their name from the distinctive ties that stop midway, which gather the fabric into droops. Voile scarves are built to work in combination with your voile curtains, providing a visual flourish along the top and side of the curtain, while still allowing light to filter into the room. Your choice of voile curtains will depend largely on where you’re installing them. In the living room, voile curtains complement heavier curtains perfectly. Given that most living rooms are on the ground floor, you’ll probably want privacy from prying eyes, but at the same time, for natural light to fill your home. A good set of voiles will diffuse the light entering your living space, and reduce glare. They’ll also serve a decorative function. Pair them with blackout curtains for the total darkness you need to enjoy your favourite films. Voile curtains are also a popular feature in bathrooms, where their lightweight construction means they won’t absorb moisture in the same way that a heavier set of curtains might. They will maintain privacy without restricting how much light can enter the room. The same problems are present in the kitchen. We need something that’s lightweight and resistant to airborne moisture, and the damage it can cause. In this respect, a 100% polyester set of voile curtains is ideal. We should also consider that drawing a heavier set of curtains from behind a 60cm deep counter can be laborious, particularly if you’re doing it twice daily. Finally, voile curtains don’t occupy much space on either side of the window (unlike their heavier counterparts) – which will leave more room for overhead cabinets in your kitchen. Match the colour of your voile curtains with your countertops and splashback - whites often work well. In the dining room, you’ll want to create a specific ambience. Choose the right pattern and they’ll form a visual centrepiece that guests will love, and you’ll be able to let just the right amount of sunlight into the room throughout the day. If you’ve got a window that gets direct sunlight in the morning, voile curtains will help soften it. In the bedroom, controlling how much light comes into the room is paramount. This is especially so if you’re working a night shift and need total darkness during the day. It’s also the case if you’d like to enjoy a lie-in at the weekends. For these reasons, you might prefer to hang a heavier set of curtains in the bedroom. Voile curtains also offer privacy, without blocking too much light. Another option are voile curtains for four-poster beds - an excellent choice if you’d like to enjoy the ultimate in bedroom luxury. Match the colour of your sheets to that of your bedding for a cohesive effect. You can even hang voile curtains on doors. Since sliding doors don’t expand as they open, they make an excellent pairing with voile curtains. The same applies to bifold doors, provided that they expand away from the building so as not to intersect the curtain. Voile curtains are also a good choice for bay windows. You might opt for smaller curtains which attach to each window pane rather than larger curtains that run around the entire window set. You can then attach heavier curtains at the front of the arrangement. Shop our complete range of voiles here.